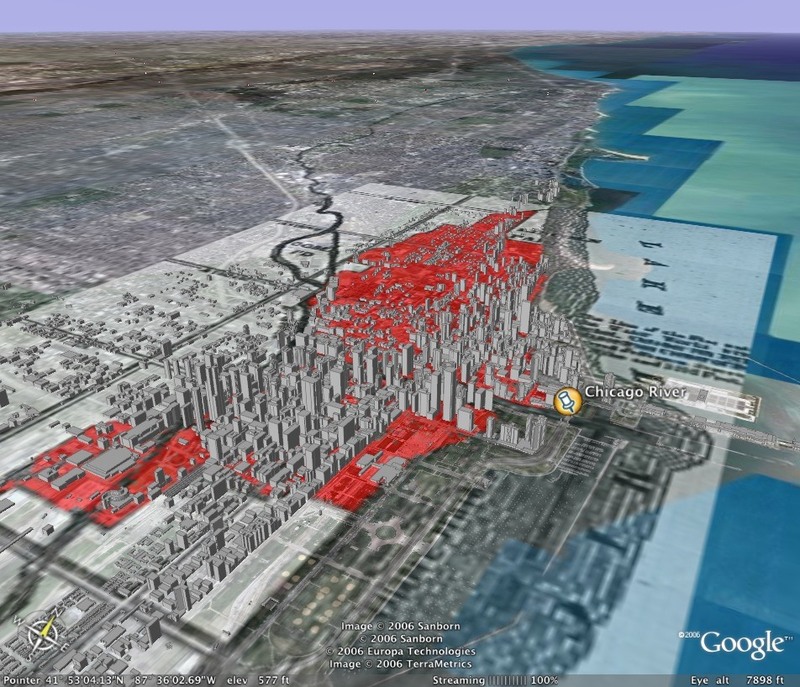 (1) 1/3 of the city gone, the red colored buildings and homes are the ones that got destructed in the fire. (2) The fire spreading rapidly with wooden houses and other flammable materials. (3) People screaming of fear,running away from the fire. (4) The cause of the fire which lead to severe problems,all its surroundings added to the fire like fuel,having hay and wooden houses around the fire caused more fuel to the fire. 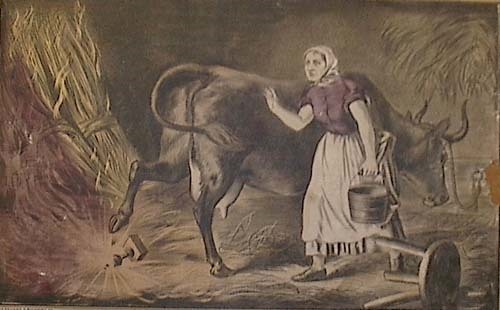 (5) Who to blame, Did the cow kicked over the lantern? Who's responsible for this tragedy? 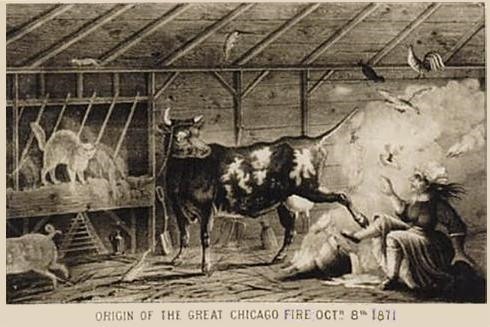 There's several testimonials based on The Great Chicago Fire, but the one that has America thinking would be Mrs. O'Leary and her cow, which has the most proof. 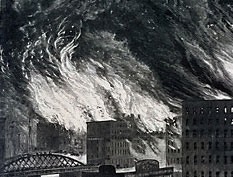 This disaster occurred on October 8, 1871, which had severe consequences towards the city. The fire spread quickly since almost all the houses were made out of wood and also had hay surrounding the barns and houses which was like fuel for the fire. 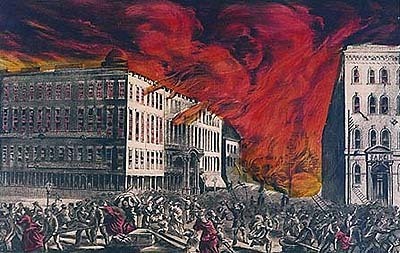 During the 1870's fires became an everyday event about 20 fires occurred per week. Residents relied on firemen to protect them in case of any emergency, it was hard for them because 334,000 residents relay only on 185 firemen including the lack of equipment they had back then 16 hours of work had the firefighters exhausted and injured because of that fire 60 suffered from burns and smoke inhalation and some were sent home due to blistered skin, swollen eyelids, smoke consisted lungs along with the rest of the firefighters that were exhausted and ill and they couldn't wait to arrive at the fire station and get some sleep after the fire no one in Chicago's Fire Department was in shape to fight any other fires that day. Cause: The legend of Mrs. O'Leary and her cow was the cause of the fire, when Mrs. O'Leary was milking the cow in the afternoon and she put the lantern right behind the cows legs which the cow kicked the lantern and all its surroundings quickly caught in flames leading 1/3 of the city in flames and made everything more complicated for the firefighters to cross the river with only a few bridges and some were completely gone so it was a fight to the finish. So this fire had severe consequences like I said which made them take action and have fire prevention weeks and other helpful events or programs, so this disaster won't happen again.